This DVD includes the two programs described below. 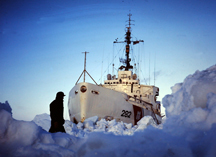 This 6,000-mile odyssey of the U.S. Coast Guard icebreaker NORTHWIND, based in Seattle, penetrated beyond the Arctic Circle to explore the polar ice cap and to test the feasibility of winter shipping off the western coast of Alaska. Becoming icebound for 8 days results in amazing film of efforts to blast the ship free. Using a helicopter, cameras captured exciting footage from the ice in front of the NORTHWIND. Here's an excerpt from the program by writer/narrator Don McCune: “The arctic winter is a whole new ballgame, a world of unreckoned forces. It's a polar world filled with primordial pressures born in the Ice Age and renewed annually. The Bering Strait, that slender, ice-clogged arm separating Alaska from the Soviet Union, had given the ICEBREAKER NORTHWIND a taste of what was to come. Bucking its crumpled, pressure-packed surface in the face of strong Northwest winds, it had taken her five days to go a little more than ninety miles.” Originally aired under the KOMO title “Northwind, Part 1 & 2”. The treacherous and remote area of the Shelikof Straits at the southern peninsula of Alaska is finally charted by NOAA's hydrographic vessel FAIRWEATHER.